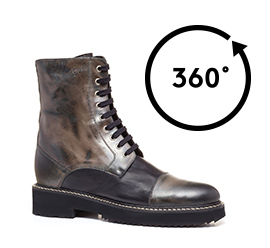 Elevator boots, handmade with upper in napa leather and brushed calfskin that gives an aged look, featuring characteristics black and dark brown polychromies. A grunge-rock inspired style, trendy and sophisticated, allowing you to increase your height up to 6 inches in complete safety for your back and posture. The special outsole in rubber has visible stitching for stylishness and superior durability. An attention to detail that makes every elevator shoe unique.